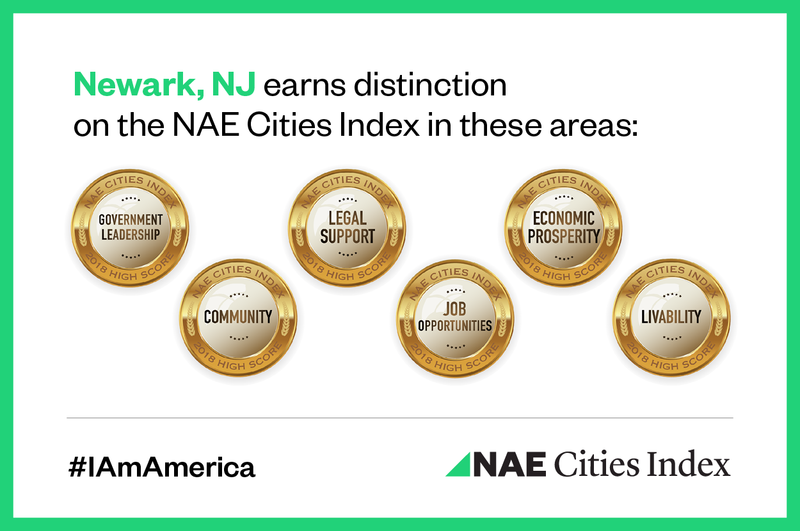 Mayor Ras Baraka announced today that Newark had made the top of the standings in the first-ever New American Economy (NAE) Cities Index. Newark earned the foremost spot on the list for distinctions in several prominent areas, showcasing offerings for immigrants in one of the most diverse cities in the nation. The announcement was made on Citizenship Day to highlight their standings in the first annual NAE Cities Index, a new national assessment of local integration policies and socioeconomic outcomes. Newark’s overall score, based on a wide array of socioeconomic and policy subjects, was 4.03 of a possible 5. “This rating by New American Economy is recognition of everything our administration and its partners have done and continue to do to support and protect the lives and rights of all of our immigrants, documented or undocumented. We are privileged to receive this award, but see it not as the end of our efforts, but as a milestone in them. We have more work to do, and we will maintain our commitment to lead and define this moral cause. I thank New American Economy on behalf of the people of Newark with both humility and resolve,” said Mayor Baraka. The NAE Cities Index examined 30 different policies and practices, as well as 21 different socioeconomic outcomes, to assess cities on their work to integrate newcomers. Assessment categories include Government Leadership, Economic Empowerment, Inclusivity, Community, and Legal Support, as well as Job Opportunities, Economic Prosperity, Livability and Civic Participation. The top 25 cities in the Index are attracting larger shares of highly skilled immigrant and U.S.-born residents, making them more competitive for business and economic investment, are more likely to see greater job creation, benefit from greater equity between immigrants and the U.S.-born across key measures of quality of life, among other benefits according to the NAE. Cities that are starting to rebound after years of job and population loss that resulted in economic instability, like Newark and Baltimore, where immigrants are bringing the much-needed skills and entrepreneurial spirit that can help develop a more stable and educated workforce, encourage new business creation, fill vacant housing, and expand local tax bases. In these cities, the gap between immigrants and the U.S.-born is much smaller than in the rest of the country when it comes to indicators such as poverty rates, educational attainment, and entrepreneurship rates. Cities that are immigrant hubs, like New York and San Francisco have succeeded in creating a welcoming environment with strong policies focused on inclusivity and providing access to city services and information. Inclusive policies help make these cities destinations for the creative class and for high-skilled businesses. However, some of these cities do not score as highly on socioeconomic measures such as access to housing or income equality. Cities that are new immigrant gateways, like Atlanta and Greensboro, N.C., are some of the fastest growing places in the country. In these cities, immigrants and U.S.-born newcomers together are helping to create the diverse workforce necessary to continue growing and attracting new businesses. These cities scored highly on socioeconomic indicators such as job opportunities at all skill levels, affordable and quality housing, and educational opportunities. Explore the NAE Cities Index and see how your city is doing here. The NAE Cities Index scored each city based on 51 unique measures, including policies like language access and support for immigrant entrepreneurs, as well as socioeconomic outcomes like labor force participation and homeownership rates. Overall scores range from 1-5 (5 highest), and offered insight into how well cities are integrating newcomers. 2018 is the first year for the NAE Cities Index, which will be updated annually to track cities’ progress. Learn more about their methodology here.